I was born with thick, black and healthy hair. But my hair underwent a drastic change when I moved here in the US 4 years ago. With the new environment, different food and hard water plus the stress in adjusting to everything new has caused my hair to shred a lot, it has turned brittle and dry. I was ironing my hair too often too, to make it look better which didn't help but worsen the situation. At one time, I thought I will go bald. I was shredding too much hair. I was glad when a pure and natural shampoo and conditioner was introduced to me a few years ago. It has Aloe vera as the first ingredient. It has improved my condition and I don't shred as much hair as I used to. But just using shampoo and conditioner sometimes is not enough. My hair is still a bit dry and brittle. This is why I put some hot oil or any hair treatment once a week. Some of the hair treatment I tried irritates my skin or didn't turn out what I expected to be. A few weeks ago I was given an opportunity to try out Old Wives Tail, an organic hair oil treatment. They sent me the Almond & Cinnamon Organic Hair Mask for my hair type. I like anything natural, organic or has more natural ingredients when it comes to my beauty products. I believe that using natural and organic will have a lasting good effect and won't cause any harm when being use for a long time. Our organic oil treatment is completely chemical free and 100% natural making it very gentle and king to your hair and scalp. after 3 days and my hair is still rocking!!! I got the product promptly and it was in a good condition. I wasn't expecting too much from this hair treatment since I wasn't sure how it's going to turn out. But I am so eager to give it a try because this is the first hair treatment I knew that is made from organic and natural ingredients. I was a bit excited. I was wowed with the result. My hair looks nourished, feels soft, easy to comb, shiny and stronger. My co-worker even noticed the difference. Also, it didn't irritate my scalp at all, unlike other hair treatment that caused me to have severe dandruff afterwards. In fact, this product helps eliminate my dandruff. The different natural oils in this product gives an aromatic scent that calms me down. I can smell the different plants on it. I like that it has almond, Shea butter and other organic ingredients which makes this product safe to use. No paraben, no sulfate, it's vegan and gluten free. It was never tested on animals. My hair was soft, shiny and easy to comb and easier to manage even after 3 days of using this. The only thing though is that the product I got looks creamy and not oily and I had a little hard time applying it on my dry hair. I had to make my hair a little damp, it's the easiest way to spread out the product. For the most part I love it and I recommend it for you to try, it works and it is safe to use. In fact I am planning to buy more when my supply ran out. 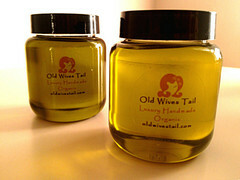 To get more information regarding this product or other Old Wives Tail Organic Hair treatment visit http://www.oldwivestail.com/ or like their FB fan page to get updates with their wonderful products and promotion by clicking here. Disclosure: I received this product for free in exchange of my honest review. However all opinions expressed were solely my own and not influenced in any way. My wife tried this recently and loved it. Took some getting used to as she hadn't used one like this before, but she's liking the results! You hair looks so healthy and shiny. I have to try this on my hair. I love the name of it!! I am always looking for things to help tame the frizz. your hair looks great! Looks super silky soft. I need to check this out. It looks like it really does great things to your hair. Looks good! I bet the cinnamon smells wonderful! And your hair looks gorgeous!